Fla. Court Decision Plunges Federal Health Law Into Limbo : Shots - Health News After a federal court declared the new health law unconstitutional, it's still unclear how far the ruling reaches. Still, the Obama administration says that it will continue to implement the law regardless of the pending legal questions. 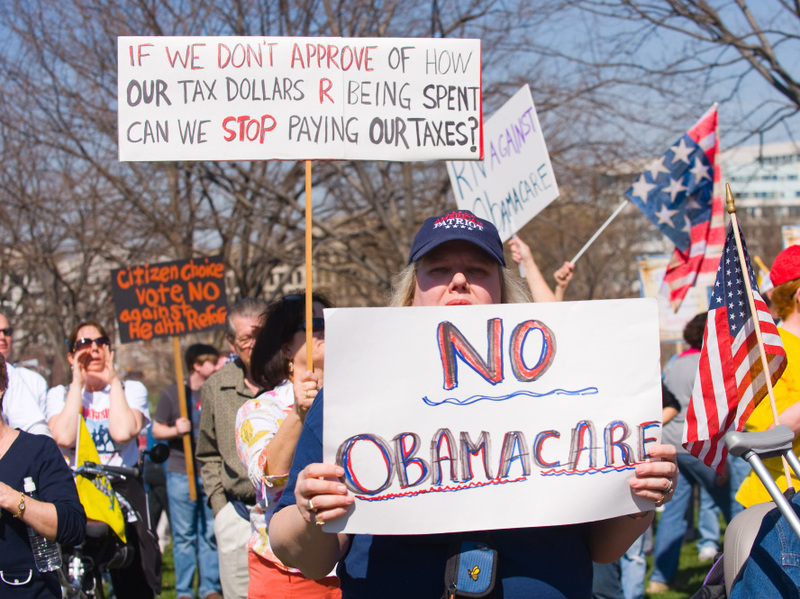 Supporters of the Tea Party movement protest health care overhaul outside the U.S. Capitol, March 20, 2010. There's only one thing that seems pretty clear about the constitutionality of the provision of the health law that requires most individuals to either have insurance or pay a penalty starting in the year 2014: The final say is likely to come from the Supreme Court. But that's not likely to happen for at least another year or two. In the meantime, Monday's ruling by Federal District Court Judge Roger Vinson in Pensacola, Fla., striking down the entire law has thrown the immediate future of the law into some doubt. David Rivkin, the attorney representing the individual plaintiffs in the case, has been telling reporters that Vinson's ruling means the Obama administration must stop implementation of the law in all 26 states that were also parties to the lawsuit. But that's hardly a universal view. "If it applies to anybody, it applies to Idaho and Utah," said Tim Jost, a law professor at Washington and Lee University. Those were the two states to which Judge Vinson explicitly granted standing to sue over the insurance requirement portion of the lawsuit, along with two individuals and the National Federation of Independent Business. The remaining 24 states in the lawsuit were largely confined to the count challenging the law's expansion of Medicaid. Judge Vinson rejected the states' argument that the expansion was "coercive." But then he struck down the entire law after finding the insurance requirement unconstitutional, including the Medicaid provisions. So what's clear now is that no one seems to know for sure how far the judge's ruling — which did not include an injunction officially stopping the administration from enforcing the law while an appeal goes forward — reaches. "It's a great big mess," said Mark Hall, a law professor at North Carolina's Wake Forest University. "There's a lot of open questions." Hall's best advice: "The government would be well-advised to get a stay" of the judge's ruling while pursuing an appeal. That's apparently something the administration already has on its to-do list. "We are analyzing this opinion to determine what steps, if any — including seeking a stay — are necessary while the appeal is pending to continue our progress toward ensuring that Americans do not lose out on the important protections this law provides," said Justice Department spokeswoman Tracy Schmaler in a statement Monday. Meanwhile, the Obama administration insisted Tuesday via the White House blog, "Implementation will continue."